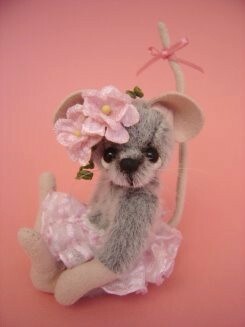 Dural, a leafy north-western suburb of Sydney, Australia is the home of Susan Leigh and home to 'Bearleigh Bears' creations. She lives there with her childhood sweetheart-husband, David, their two daughters, Sarah-Jane and Jessica, their two dogs and two ponies. Susan's love affair with teddy bears started in 1999 when she was still living on a farm teeming with animals just outside Johannesburg, in South Africa. 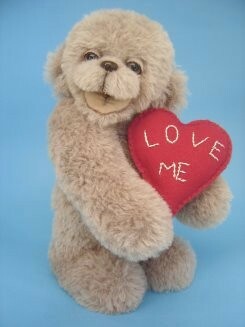 "I think my great love for teddy bears is a result of not having a teddy as a companion during my childhood years." After immigrating to Australia in 2004, Susan joined a bear-making class. "This sparked the desire to create my own unique teddy bears." It was only after attending a design course in 2006 with a well-known Australian bear artist, that her dream turned into reality and the first Bearleigh bear was born. 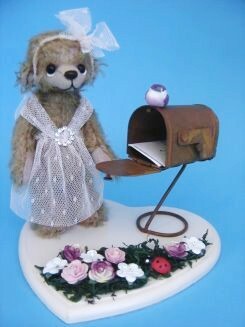 "My very first bear was an 18cm bear which turned out really well and now has a place of pride on my mother-in-law's dressing table." Her favorite medium to work with is recycled fur coats, especially mink. "It enables me to create delightful expressions and faces on my bears," she remarked. "The bears just look and feel unique made out of real fur." It also brings Susan great pleasure when someone gives her a coat that's been hanging in the closet for many years and she can turn it into a few bears that can be passed on to the collector's grandchildren as family heirlooms. "The best reward is seeing the delight on a collector's face and knowing that all the many hours spent creating that little bear are rewarded in that smile." Susan loves making the noses from polymer clay, especially with the recycled fur bears. "I also love doing sculpted feet; whether they are trapunto toes or pulled toes. I draw my inspiration from various places, sometimes from an ornament which will accompany the bear or from a lovely lush piece of mohair or recycled fur." 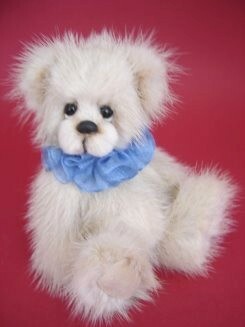 For her huggable creations, she uses only the finest quality mohair, alpaca or recycled fur fabrics. "I feel that my creations are continually evolving as my passion for designing my own creations grows." 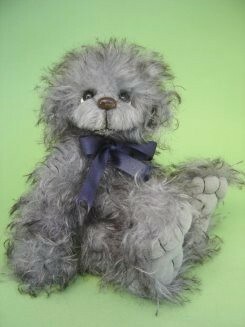 Each bear is hand sewn and she spends many hour capturing the chubby cheek and individual expressions. Susan belongs to a few groups of bear makers, such as Master Bearcrafters, McBears, Teddy Bear Society, and Teddy Bears and Critters Australasia. She has participated in various shows and exhibits and at international shows. One of the highlights of her bear-making career was winning 1st and 3rd prize for her creations at the Royal Easter Show in Sydney in 2006. "I have had a profile and patterns published in Australian Bear Creations Magazine," she said, but has only recently started entering competitions. Most of her sales are through shows or her web site. "Luckily, I am able to spend most of my days making bears. I complete about 100 bears a year. Other days are spent working in a local teddy bear shop where I teach people to make their own bears." She even gets to pass on tips and techniques in order to help her customers be better equipped to make their own bears. "What better job could anyone wish for! I am very lucky as I am able to do what I am passionate about everyday."